Probably you have seen this all over the web recently. I first heard of it a while back on a blog, but I can't remember which one at the moment. Anyway, I tucked the idea away in my head for the future and it certainly came in handy in our new house. 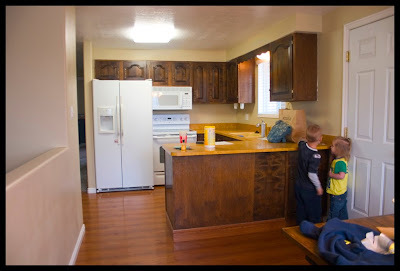 You might remember from my tour post, that our countertops were a brightish orange color when we bought the house. My first priority was to get them painted, because I didn't want to have to do it while we were living in the house. It's a fairly easy process, but there is a lot of coats and drying time involved. There are some great tutorials around the web. I think this one is pretty useful. I just read a bunch and determined my own way of doing it. I used a BIN shellac primer first and did two solid coats. This is what it looks like after primer. Sooooo much better already. Then I did two coats of a soft white called Swiss Coffee from Glidden. Not much different. 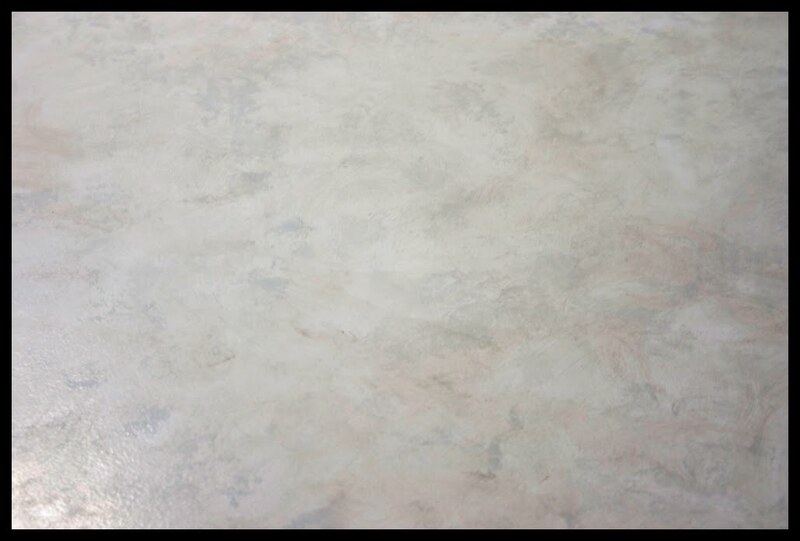 Then I did some splotching with a wet paper towel in a light gray called Polished Limestone, also by Glidden. This was probably the scariest part. I haven't even done any sort of faux painting before. I wasn't trying to mimic the look of a natural stone, I just wanted something soft and modern looking. It was looking pretty good after that. 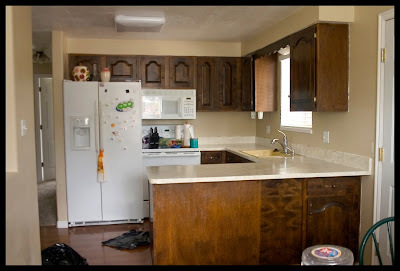 I had always planned to use a brownish gray on the top called Wood Smoke from Glidden (I really like their colors) on top, but I was pretty scared to do it. I decided to do a slight wipe over with a wet paper towel, to give it some depth. It worked out perfect, and I love how the brown tones pick up on the cabinets and really tie it all together. 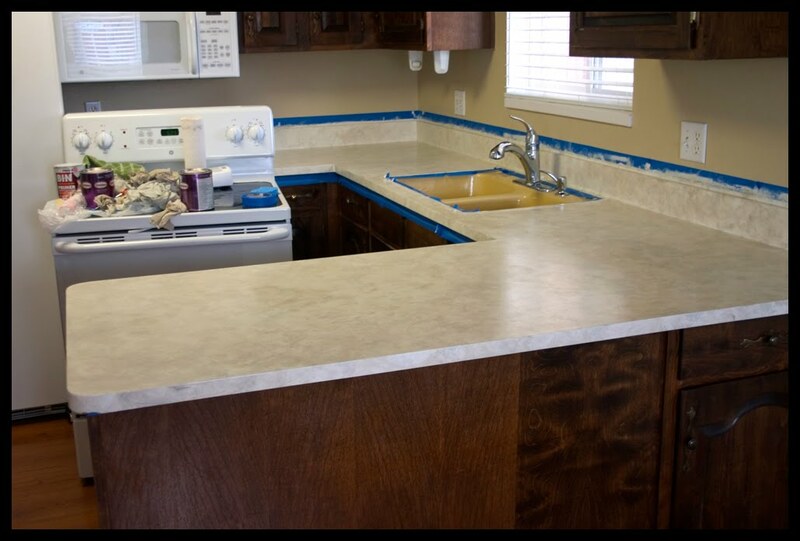 Three coats of polyacrylic later and my countertops were finished. I adore them and they changed the entire mood of the kitchen. You do have to be a little more careful with them than laminate, but it's so worth it. I mean, who really would risk using a knife straight on their countertop without a cutting board anyway? Not me. You'll notice that the tape didn't come off too cleanly. I did score it with a craft knife, but it just wasn't happy to be leaving. A little spackle and some paint and it looks really good again. 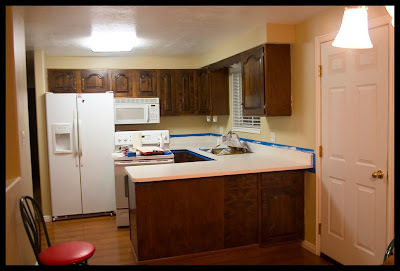 I'm trying to decide if I want to put up a backsplash, or leave it painted. One part of me really wants to put up a pretty tile backsplash, buuuuuuuut, I want to gut the kitchen at some point in our ownership (David and I disagree over this a little bit, but we'll see what happens), and spending money on a backsplash when I could be saving it for a huge kitchen makeover isn't all the that tempting. The more I do in the kitchen, the more I lean toward keeping this kitchen around for a while; it's actually looking pretty and much more updated than I imagined. 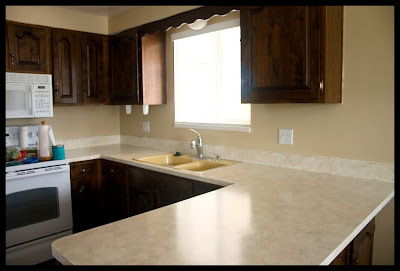 I even have a plan to work that crazy mustard yellow sink in so it looks like I did it on purpose. It looks sooo much better! I think it does look like faux stone! Looks amazing, Kara! I'm impressed you took the faux-painting plunge, you're a brave woman and it paid off. Beautiful job!! It looks amazing.. and so much better than the orange. I love projects like this!! Looks great! I painted my countertop with Rustoleum countertop paint and it has chipped. I think I am going to repaint it trying this method. Wow! I had no idea you could do this. Those look ah-mazing!! Holy cow what a transformation!!! Great job. You obviously have serious patience with all those coats of paint. But the end result is excellent! Awesome work. You should share this at my link party this Thursday. It's really great and I'll feature you the week after if you post it. I have been wanting to do this, but have been afraid to it. Question though, did you use an oil based paint or acrylic? Thanks! April, you can use either, but if you go with one, use it all the way through. Shellac primer will work with oil or acrylic. I used acrylic paint and polyacrylic sealer. I would have preferred to use oil for all of it, but Home Depot doesn't do custom mixed oils and I really was married to these colors. HOLY COW!!!! That looks fantastic! 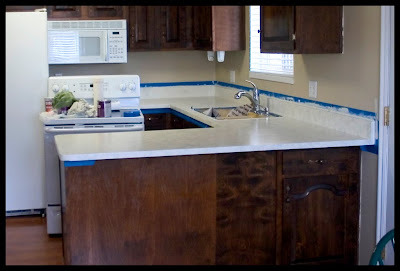 Like your kitchen got in a time machine and moved from the 70s to the new millenium! Good job! I can definitely see working in the yellow to make it work in there. I can also see maybe painting the cabinets as well to lighten the room up? Just a thought. ;) It looks amazing. Great job! Wow! What a transformation! 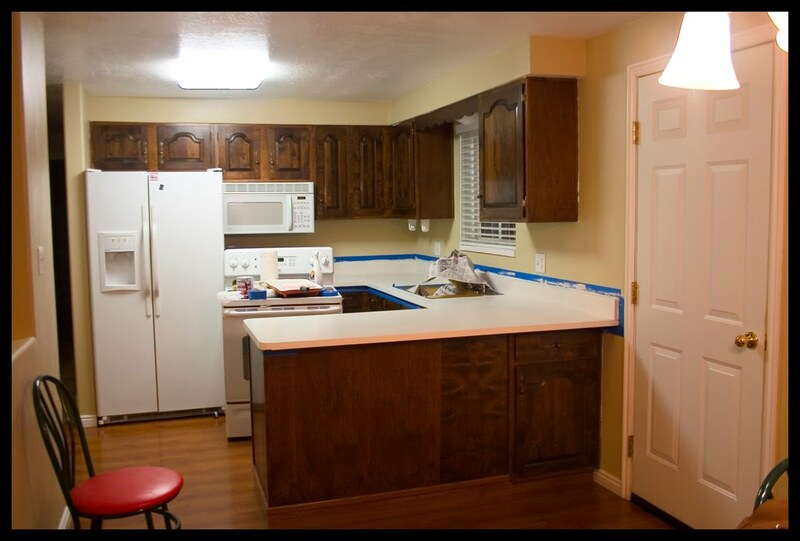 I would never have thought to paint laminate. 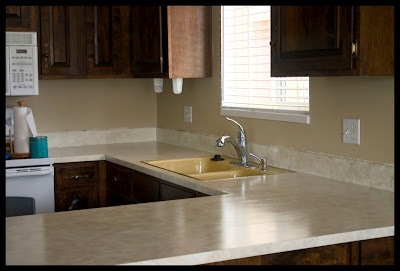 Your counter tops came out amazingly well, and your faux finish is just soft and subtle enough that it looks like stone. Wonderful job! This is one of those projects I will keep on my permanent remodeling list. it actually looks great! Quaint and neat. This is somewhere you can grow old into. Fabulous! What an amazing transformation... great job! That is impressive work! I would have never known you had never done faux painting before! I might just tackle this job once I get my other cabinets in and have to make everything cohesive. I'm on a tiny budget, and I certainly cannot buy anything new. This will help me out tremendously! Thank you for posting! I've been thinking about doing an update, so great question! They are holding up extremely well, 2+ years later. I've been meaning to do a few touch ups and another coat of poly, but I haven't got around to it. I'm sure I've scrubbed off a lot of the poly with how much food my children stick to the counters! (I even take those green scotch pads to it when I can't get food off of it). I've been honestly amazed at how well they've done. I have maybe three tiny chips in the paint, and they are like 1/3 the size of a grain of rice. The finish has held up beautifully and doesn't stain. If something looks like it's going to stain, some Clorox disinfectant kitchen spray takes it right off. I'm not very careful with them, and they've even held up against heat. I have my toaster oven sitting on it with no damage. Once my oldest even set a hot cookie sheet directly on the surface with no damage. Not that I would recommend that. The only thing I don't like is that I didn't tape off great around my sink area. I would probably have cut in around it with a brush, or been a lot more careful. People don't believe me when I tell them that they are painted. :) I'm not sure it will hold up for 10 years, but I think I will get at least 5 years out of them, maybe more. How long did it take you to do the whole project? (How long for each coat of paint?) We rent and my counter tops look similar to yours, I've been dying to update them but am not willing to put in a lot of money for a place we don't own. Also, did you spray or brush the paint on? Thanks & great job! Great job! I few questions: Did you spray or brush the pain on? Also, how long did the project take? (How long for each coat to dry?) Just wondering if I can pull this off with a 19 month old and hubby running around... Thanks! Stacie, so sorry it took me this long to reply. I think your comment got stuck in moderation or something. It took me about three days to do the whole project, but I wasn't living in my house, I was living about 20 minutes away and was only coming over once a day, so I couldn't do it any faster. I think you could probably get away with doing it faster, maybe 12 hours of drying time between the primer layer, the regular paint layer (you could do the faux painting without so much drying time in between colors--it would just need to be dry to the touch), then another 12 or so for the polyacrylic. BUT, I would ask the place where you are buying the paint--they would know more specifically for the paint you are using. I used a small, low pile roller to put the primer, base coat and polyacrylic layers on.